It was therefore just over 30 years ago when I learned, through a snippet in the national press, that Wilf Slack had died whilst playing cricket in The Gambia. As the weeks passed, more details came to light and obituaries appeared. But it was not until just a few weeks ago that this reviewer actually acquired this splendid Appreciation, the inspiration for which was Wilf’s sister and soul-mate, Phyllis. Born on St Vincent‘s west coast at Troumaca, which this reviewer has visited in an earlier existence, Wilf and Phyllis moved to an England of “cold, unwelcoming weather” to join their parents after early upbringings in the Caribbean. Wilf was 11 when he made that trip, but he had already been introduced to cricket and other sports in his home village. His love of cricket “first began” in the West Indies, he recalled: indeed, Wilf was playing for Troumaca Government School as early as 1964, when shy of 10 years old. Bridgette Lawrence expertly put together a biographical tribute to Wilf, from those early days in St Vincent, through his first few years in Britain, to club and Minor Counties cricket, then on to Middlesex and beyond eventually, albeit for an all too brief period, to England. There is interesting detail on his school and club cricket, including a 1969 photograph of his school XI. He was also a promising athlete and basketballer but his talent for cricket shone through. His school head introduced him to village cricket where he became something of a star turn, helping his side to the last 16 of the national village knock-out competition in 1974. He soon moved on to High Wycombe, the senior club in his area, and by 1976 was playing for Buckinghamshire in the Minor Counties Championship. He had attracted first-class county interest by then, however, having trials with Warwickshire, Northamptonshire and Middlesex – and it was the latter than ultimately snapped him up in 1977. Bridgette Lawrence deals efficiently with Wilf’s first-class career, the inevitable downs interspersed with many ups, and the eventual summons ironically to the West indies to replace Mike Gatting whose nose had been put out of joint by Malcolm Marshall. We learn of his coaching seasons in New Zealand and all the friends he made there, for a while alongside Ian Gould. 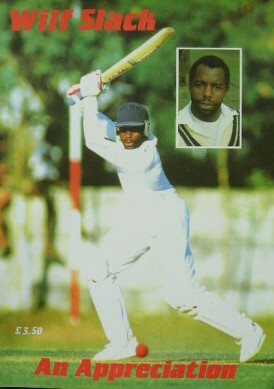 And we read of his playing for the Windward Islands in the Shell Shield for a couple of seasons in the early 1980s, where he was treated as something of a hero – he played once back on Vincentian soil, at Arnos Vale, an hour or so’s drive from his native Troumaca. As borne out by all the very many individual tributes contained in this book, Wilf was not just a talented cricketer – he was a talented human being. There was no side to him, he treated everyone the same, he was supremely laid-back but he was always thoughtful and caring. He had a great affinity with children. He loved coaching and was evidently intent on spending time in later life coaching underprivileged children in Africa. He paid his way on club tours. He was modest and excellent company. Maybe the most moving tribute is from Kenau Barlow, Graham’s wife, because he talked to and spent time with her when she felt lost. Statistics by Eddie Solomon help tell the story of the cricketer. Tributes and memories by a whole host of well-known names (Brearley, Butcher, DeFreitas, Foster, Gould, Haynes, Nicholas, Wingfield-Digby and many others) tell the story of the man, along with Bridgette Lawrence’s excellent words, in this publication put together by Wilfred Norris Slack’s old pal, Anwar Moghul, for the ‘Wilf Slack Memorial Fund’. Several years later, I was in The Gambia and walked across the McCarthy Square (now July 22 Square) cricket ground in Banjul, where Wilf died at the crease. On that occasion, I did think of him, his career and his passing; but this Appreciation brought into the public domain just what an exceptional loss to the cricketing and wider world his untimely death was.